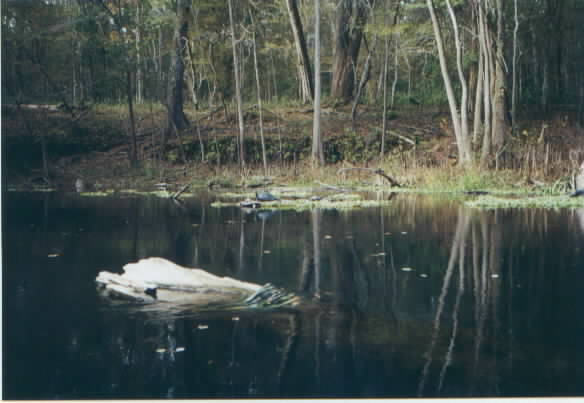 Located off of Hwy 441 about 6 miles north of High Springs, O'Leno State Park is located on the banks of the scenic and unique Santa Fe River, a tributary of the Suwanee River. Within the park, the Santa Fe disappears and flows underground for about 3.5 miles (River Sink) before it again becomes a surface stream (River Rise). 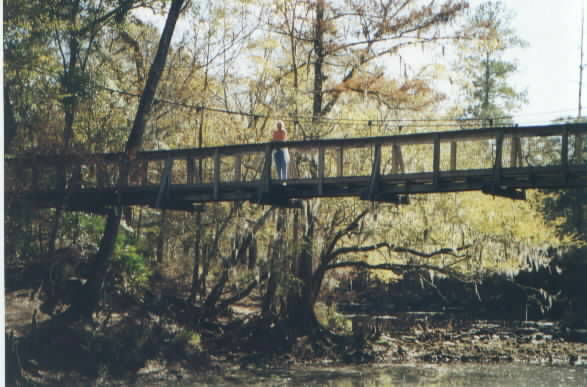 The park encompasses in excess of 6,000 acres in Alachua and Columbia counties. 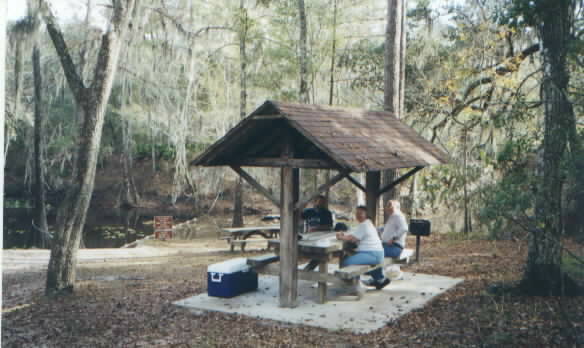 The Magnolia Camping area is in a pristine shady Hardwood Hammock near the main Park on the Santa Fe. Another camping area named Dogwood is near the Park Entrance. Deer have lived here in this no-hunting area for many years, losing their fear of man. 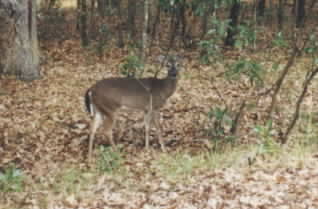 It is a daily occurrence to have deer wandering throughout the park and even up to individual campsites. In the mid-1800s a town was founded upstream from where the river disappears. Perhaps first known as Keno, later called Leno, then Old Leno, it became known as O'Leno. Leno was at the end of the line for the first telegraph set up to link Florida with the outside world. When the railroad bypassed the tiny town, Leno declined, becoming a ghost town by 1900. The Old Wire Road and mill dams are all that remain of this early lumber town. The park, acquired in the 1930's was developed by the Civilian Conservation Corps (CCC) and the Works Progress Authority (WPA). The Suspension bridge which spans the River, the Large Log Meeting House and a Picnic Pavilion were built about 1935 by the CCC and are continually being maintained and restored as of this date to keep their original nature. The old stone steps down to the River and a unique old Limestone Cottage are also relics of that era and add charm and flavor to the Park. Camp arrival. 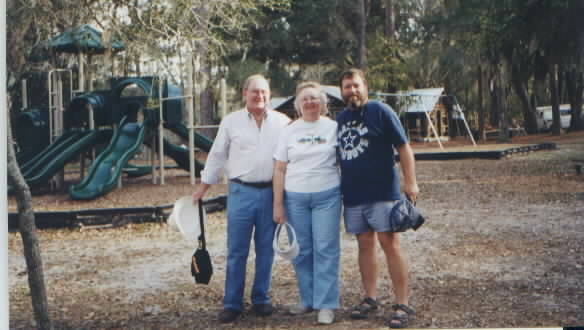 We were at the Magnolia campground close to the Main Public Park area. There was another (Dogwood Campground)about a mile west, near the main entrance. 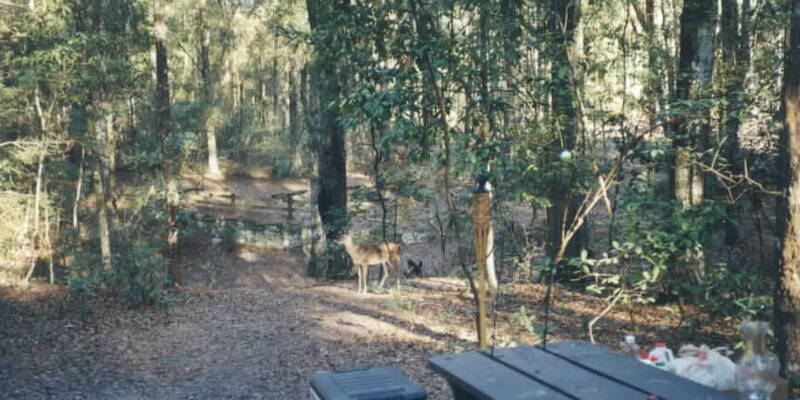 The next morning a deer appeared in our camp, very near the picnic table. Several more visited and even more at dusk. 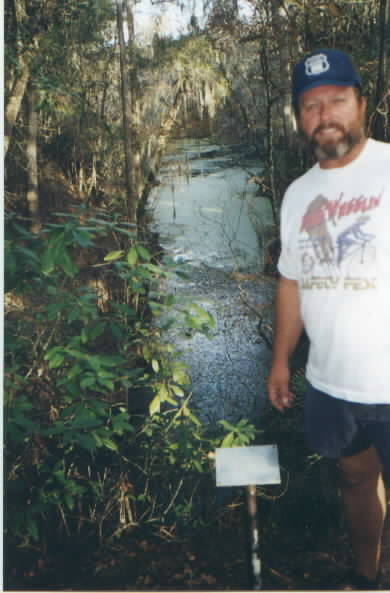 The Santa Fe River, a tributary of the Suwannee. It was too low due to drought to do much good canoeing. 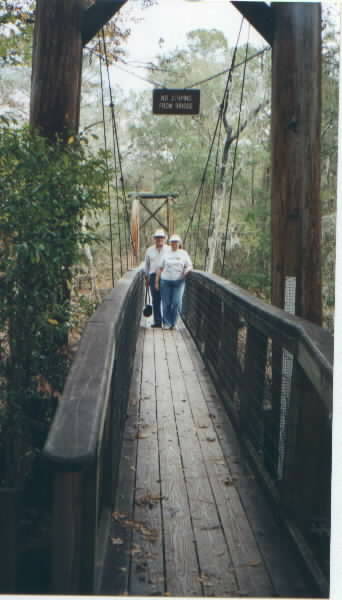 Dave's folks, Carol & Alton, on the Suspension Bridge over the River. This bridge was built in 1935 by the Civilian Conservation Corps (CCC). 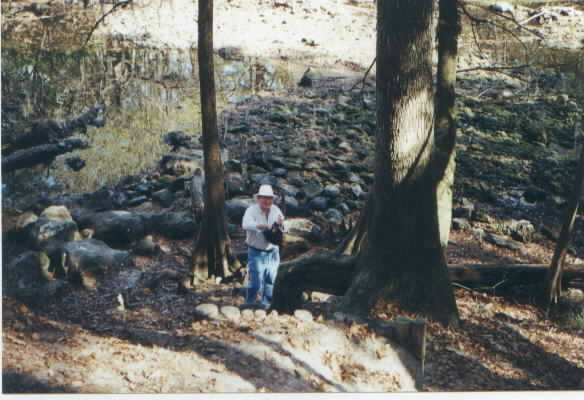 It is the beginning of the River Hiking Trail. 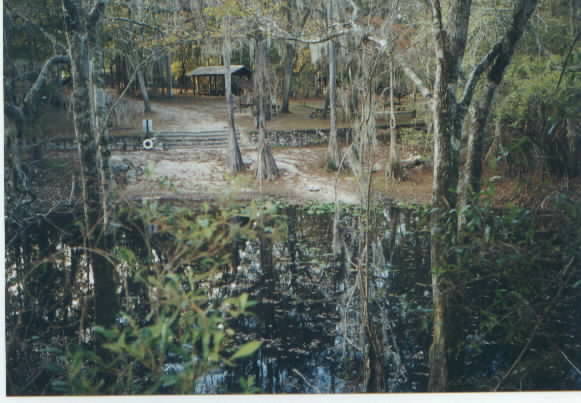 View of the swimming area. 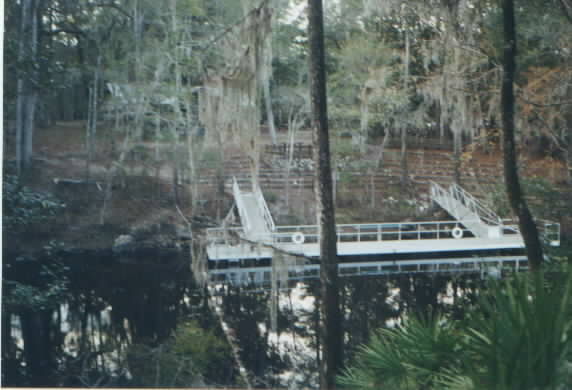 Nice aluminum floating Dock with ladders, probably a very popular spot when the river is at normal levels. It is roped off to keep boats out and swimmmers within safe boundaries. 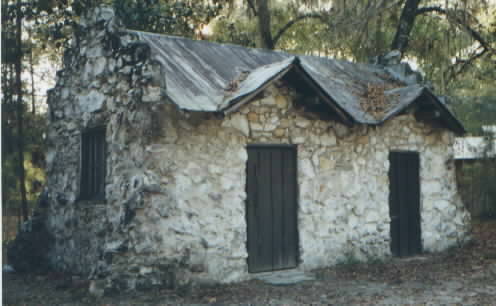 Limestone Cottage. No longer being used as a rental, it still adds charm to the old Park. 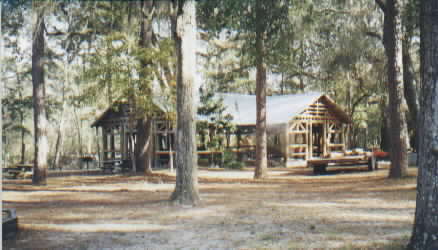 Nearby, newer cabins made of wood can be rented to campers. Picnic Lunch. Dave, Carol and Alton shown relaxing after our meal. The Sante Fe River is in the background. 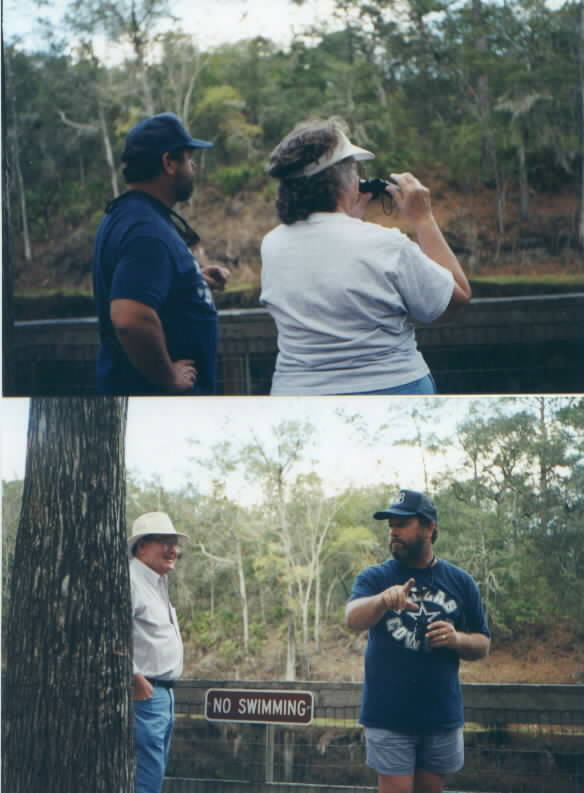 Dave and his Mom, Carol, checking out the river wildlife on the opposite bank - mostly turtles....BIG ones. Below, Dave and his Dad, Alton "horsing around" on the observation deck. 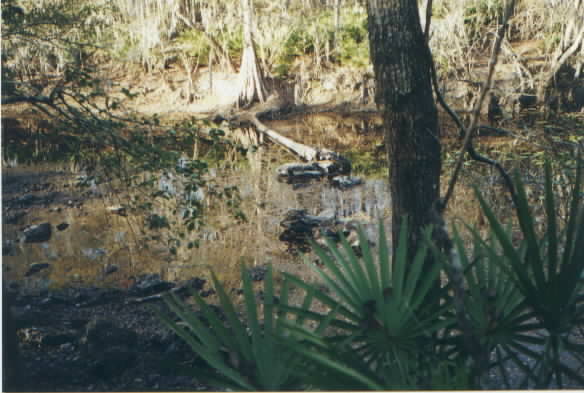 On the River trail, beyond the River sink. Behind Dave is a large sinkhole that reveals the underground river for a brief period before it disappears again. Camp at Night. Christmas lights and Tiki Torches! The Citronella fuel in the torches keeps the skeeters away - and makes the campsite look cool! 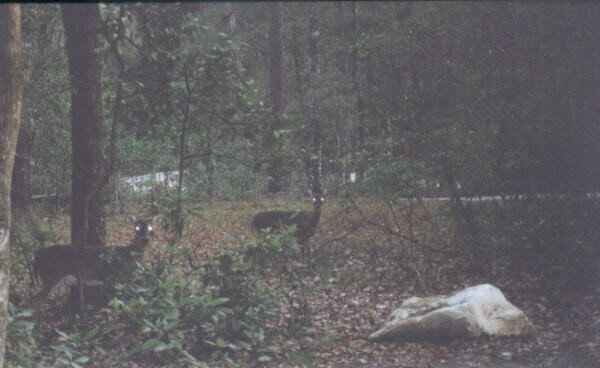 The deer living in the park, have not been subjected to hunting and have no fear of humans. "Deer in the Camera Flash Look". At Dusk they graze outside our dining window. 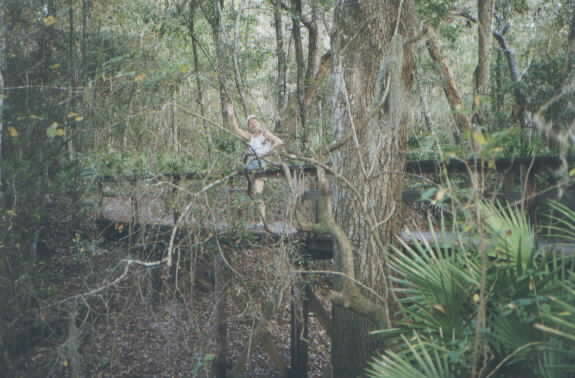 Squint real hard and you'll see Janie on the bridge looking out over the river. Just beneath - the remains of one of the old mill dams remaining from the old town of Leno that used to exist here. Playground. It has swings, slides, and a large sandbox. Looks like lots of fun for the kids. 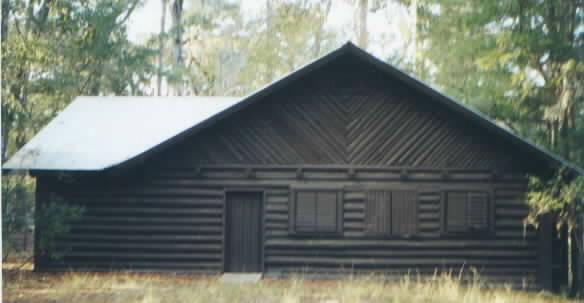 Log Meeting House. Two fireplaces at each end and a galley plus a BIG room for meetings or parties (looks like it would make a perfect Dance Floor to us!). 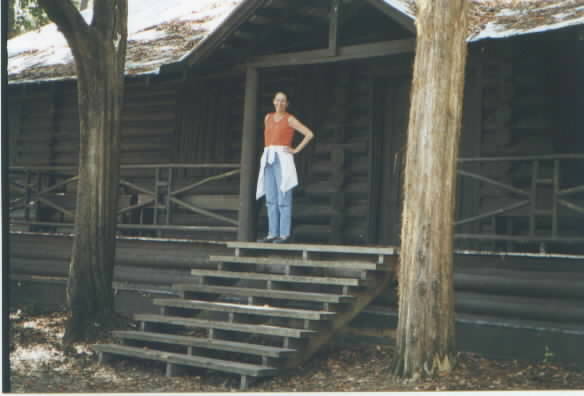 This old Log House built in 1936 by the CCC was being restored when we visited. 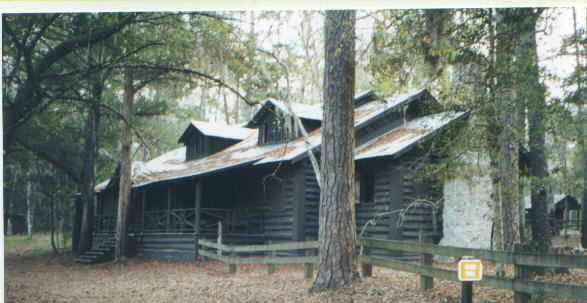 Sideshot of the old Log House shows the structural details. Can you tell I find this building facinating? Alton checking out the ruins of one of the old mill dams. The River Sink. Here the Santa Fe disappears underground for 3.5 miles before it rises again to become a surface stream. 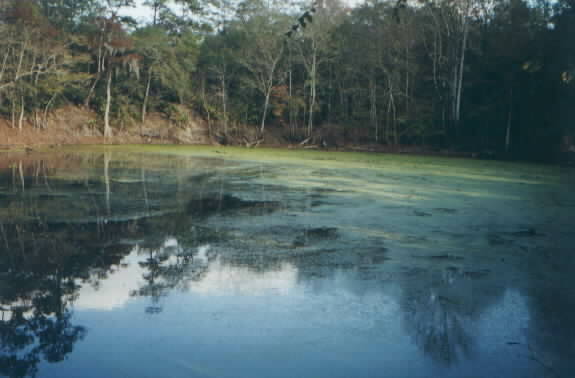 The green stuff in the background on the water is tiny waterplants that float on the surface and can't follow the river any further.